What would happen if the entire population of adults in the U.S. reduced the amount of time they spent sitting or watching television? Researchers, whose work is published in the British Medical Journal Open, say Americans may live longer. They estimate a gain of two years to life expectancy for reducing sitting to less than three hours a day, or an additional 1.38 years if everybody limited the time they spent plopped in front of the television to two hours. "Right now, if you're born in the U.S. this year, your life expectancy is 78.5 years," said Peter Katzmarzyk, Professor of Epidemiology at Pennington Biomedical Research Center in Baton Rouge, Louisiana. "What we're saying is, if you got everyone in the U.S. to sit less, that population-level life expectancy would be two years higher. Our life expectancy as a country would be 80 years." Keep in mind that this research is based on associations, not causes. The researchers did not prove that sitting more is the cause of earlier death. But they examined previous evidence that sitting appears to have detrimental effects on lifestyle. Katzmarzyk, along with I-Min Lee at Harvard Medical School in Boston, quantified the behavior to see the effect on the life expectancy of Americans. They studied five prior studies, which involved 167,000 men and women ages 18 to 90, which were done in several different countries. They looked at the health risks of sitting and then used the U.S. National Health and Nutrition Examination Survey, or NHANES, to determine how prevalent sedentary behavior is in U.S. society. "A lot of people are sitting a lot and a lot of people are watching a lot of TV," he added. "So when you combine these two things, that's when you get the true population risk." Katzmarzyk stresses that the study is not comparing people who are sedentary versus those who are active, but instead looks at the country as a whole. "We know at an individual level that sitting's bad for you, but by putting this at the level of the population and life expectancy, we understand that it is such a frequent behavior that it's just as important as obesity, it's just as important as activity, it's just as important as smoking," he said. Studies about interventions to get people to sit less are something that he hopes to see, especially in the workplace. In addition, Katzmarzyk says he would like to see research guiding Americans on how much sitting exactly is "too much." "Right now, all we can say is we want people to reduce the amount of time they spend sitting," he said. "We can't actually say what that magic number is." The 2008 Physical Activity Guidelines for Americans recommend adults should get at least 150 minutes of moderate to vigorous physical activity each week. "You can meet those guidelines but you can still be very sedentary (or sit a lot) so they're kind of separate risk factors," he added. Dr. Melina Jampolis, a physician nutrition specialist and CNNhealth.com's diet and fitness expert, was not surprised by the study. "We really need to try to be more active in general," she said. Jampolis gives the following suggestions to turn a sedentary day into an active one. And here are some ways to be happier at work, too. "There is a lot of overlap between sedentary behavior and poor cardiometabolic markers, which can increase your risk of diabetes and heart disease," Jampolis said. More corporate propaganda to get people to do more, for less. It's good for you! Sure. sure, the fact that I've lost 5 pounds just by switching to a standing desk is propaganda. If propaganda makes me lose 5 pounds, I'll have some more, please! i hope they didn't spend a ton of money to figure this out.....................duh! You know, just claiming to be skeptical of everything does not make you smart. Stop trying to make yourself feel special and much more intelligent than "sheeple" (I guarantee you've used this word at least once), and shut up. You're a complete moron. Honestly, how does one look at health advice and make the jump to "Nope, this is just a trick"? That's rediculous, you can't tread mill while you are typing. Perhaps you can't type while on a treadmill but you can certainly stand and type. You can type while on the treadmill! It goes very slow – sort of an always-in-motion concept. I've seen it in action and know that it works. 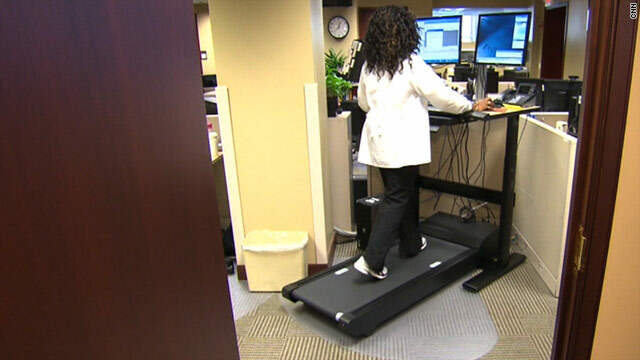 The person with the treadmill desk also lost 20 pounds in a year with no other change to her exercise or eating habits. Sure you can...just that the end result is going to look really bad! Yes, you can. I've written entire novels that way. I've been working for 4 years on a treadmill. You can type at the same speed going at 1 mph once you get used to it. I've lost 25 pounds (19% of my body weight) in 1 year and cured my diabetes. It's up to people if they want to stay sedentary, overweight and ill.
Sunday 4th of July BBQ Potluck ?? No clue what we will do for 4th of July but if you are looking for some ideas Jay Thompson the incledibre broker of Thompson's Realty (the brokerage Spectrum Group AZ is under)has compiled a great list of fireworks shows across the valley here. Think about all the extra electricity it would take to power all those treadmills. Not a good thing. Keep sitting, lardass America, and die young to make room for the next generation of hogs. Wait wait.... so your telling us that if we had more exercise, that we'd live longer?? STFU this is GROUND BREAKING!! WHY DIDN'T ANYONE WASTE BUNCHES OF MONEY ON THIS "RESEARCH" BEFORE!!?? Next their gunna spend years and thousands of dollars "researching" smoking to discover it's bad for you and shortens your life!! I am now in my first desk job where I sit 8 hours a day with maybe a few walks to the bathroom and kitchen. It's awful. I have gained nearly 10lbs a year later just from sitting all day and it's not in flattering places. I recently started going to the gym after work and go to places like the mall just to walk during my lunch break. I walk everywhere I can outside my neighborhood. I sometimes miss my college retail job because of how active it was. Hey look on the bright side: at least you have a job. I hate having a desk job. I long for the days when I was a server and ran around for an entire shift. I even tried having a stand up desk like the one shown, there is almost no point on standing unless you are only there for a short time. Like working in retail or serving, you are constantly walking, not standing. Standing is incredibly boring and eventually leads to leaning and then, sitting. I need a new line of work. Off to be a farmer. No kidding. At my current job, I've always had a desk, but I had to interact with other departments in other parts of the building, so I made a point of getting up and walking to where they are rather than call or email. Then the Powers That Be decided to put us in an "open space plan" (read: cubicle farm). They brought in efficiency experts to determine which departments worked together most often, and seated us all next to each other. They said it was to "maximize efficiency." What it's really done is minimize the amount of time we ever get up and leave our cubes. After experiencing a lot of lower back and tailbone pain from prolonged sitting, I asked for a standing work station and was told the company was not going to be spending any more money on furniture. I started walking around the office 3 times a day. I consider them "cigarette breaks" like smokers take, except instead of standing around and smoking, I walk around. I lost some weight and feel much better. I also discovered that we can use stairs instead of the elevator, so I go up and down to the 4th floor 4 times a day (my 3 breaks + coming in the morning and leaving). Sadly, I'm the only person using the stairs. Are people ignorant about this, or just so lazy? I see some of them going to the gym, then they come back and use the elevator to go back to work instead of taking the stairs... ??? I'd also like to add that many of my family members overseas are in their late 90's and to this day can walk circles around me because they are/were farmers on a mountain side and they have been doing strenuous walking all their lives. Get a retail job, you won't be allowed to sit anywhere from 6-12 hours per day, actually even standing in one place for more than a minute or two will be considered "lazy". Glad my backaches and feet hurting is now considered "healthy". Literally just stand instead of sit? Or do they mean exercise? Like, could people stand for hours while watching American Idol, I don't get it. Only 2 extra years for all that effort, No Thanks. I think I'll sit. LOL, yes me too. Why would I want to live two more years longer? Two more years of bills to pay........no thanks! Isn't this obvious? Increased life expectancy with more standing and less sitting is merely a correlation. Lazy people tend to "sit" a lot more as in watch TV and not exercise and are likely to make worse health decisions such as with regards to their diet. This article isn't saying you should stand while performing tasks that were meant to be done sitting, but rather to increase the amount of exercise we get on a daily basis for an increased life span. Like we haven't heard that one before. 2 extra years of retirement means you'll have to work harder to get there also. i like dogbert's advice: Eat more bacon. Does Big Pharma knows you are posting this article? Healthier people = loss on their profit! While the treadmill in the picture is a bit much, many people at my office have made their cubicle desks into standing desks. This cuts out about 7 hours of sitting a day for them, they enjoy it and are still very productive. Steven July 27, 2011 A few years ago, as I was entering into the fray of olinne dating, I exchanged a few emails with Kate (the years before the blog). I couldn't quite figure out why she'd emailed me, as we didn't have a lot in common. However, as I was recently separated, I didn't think too much about it. *Anyone* would be better than the one I'd left.At the time, though, she lived in Everett, and I had enough wits about me to figure that was too far, especially since I was in Burien. I backed away before actually meeting her.Recently, though, I came across her olinne profile again (I'm back on the scene), but decided against emailing her. (1) I don't think it's worth trying to get a date just to find out whether she's open about her blog. (2) In the back of my mind, I'm afraid she might say no.' (I'm not very flirty in email, which seems to be a prerequisite of hers. )As lucky as a guy should feel to have her decide against a 2nd date, could you imagine being denied a 1st? The mind boggles. So the sollutions to this problem are things which would get you either laughed at or fired or both in most work places...and this is useful how? I work out of my house and invested in treadmill desk that adjusts, so I can sit as well when I'm tied of walking. I find that I stand more and at a .6 mph pace, I can type, do con calls, etc, etc Too bad I couldn't get my company to spring for it, but it is the best investment I have made, work wise. Where I work, there are about 800 employees. In this business park, we have a gym on site available to anyone who works at any of the businesses in the business park. We have a beautiful lake with a wide, concrete sidewalk all the way around it. We have acres of paved parking lots and streets. Inside our buildings, we have extra wide hallways perfect for walking. However, the gym has fewer than 15 people that use it on a daily basis during an 8 – 10 hr. work day. Hardly anyone walks or jogs around the business park or lake. Having said that, there are many obese people here who take smoke breaks every hour, go to our onsite cafeteria and eat burgers and fries everyday for lunch, then complain about wanting to lose weight and wanting to get into shape. I've offered to provide a daily, early morning exercise class that includes 30 minutes of gym time with light weight training followed by 45 minutes of walking/jogging outdoors around the business park. Out of 800+ people that work here, 0 people responded. People give 101 reasons why they can't exercise at all because of ailments from head to toe. I was obese most of my life until 8 yrs. ago. I lost 80 lbs., got really fit, and never looked back. I understand that some are beyond the point of being able to exercise, but many still can and choose not to. There's one formula that works 100% of the time. Eat less, exercise more! The bottom line is that we all must take responsibility of our own lives and make changes and better choices that'll help keep us going a little while longer. However, doing nothing is always an option, maybe not a good one, but an option. Congrats! More power to you. It saddens me to see these overweight people, who are also parents of overweight children. What a burden for the kids to have to deal with later in life. If these out of shape people can't do it for themselves, at least help the kids. Sorry, got a little of topic there. My workplace has the treadmill, it has been wonderful. Great way to to get exercise in and be productive at the same time. I lost over 15# since using it with proper diet. So I guess NBA bench players, who are some of the best conditioned athletes in the world are in BIG trouble. My basketball knowledge is not that broad, but the bench players sit all practice too!?!? WOW, no wonder they never get to play Sitting for 1 or 2 hours at a game is not the same as sitting 8 hours a day, 5 days a week..
Sly and The Family Stone had it right – – – EVERYBODY STAND! 'Less sitting may lead to longer life'! What brilliance! Another winner from wonderful 'researchers'! What would we do without them! Onward to the next 'research'! Throw out the wastebasket in your cube/office. Walk to the common area regularly (usually a kitchen) to throw stuff out. Not only do you save a plastic trash liner every day, you force yourself to move around regularly. You're not going to lose weight because of it, but it's a small change that may lead you to a more active path. It astounds me how lazy people can be and how focused they are on convenience when efficiency is not a concern. I have a partially collapsed L5 disc which makes sitting in a chair for long periods of time painful. I purchased (at my own expense) a used standing height desk and rubber fatigue matt to stand on at work. The first week of standing was hard, I couldn’t make it thru the day without sitting down and my feet hurt. The second week started getting better, now after six months of standing, I love it and will never go back to a sitting work station. I also commute (6 miles each way) on bicycle every day and practice yoga four nights a week. I'm now enjoying my best fitness since I was 18 years old (I'm 52.) I'm able to run circles around most guys half my age. Standing at work may or may not add years to my life expectancy but I know it has definitely helped improve my fitness and thus the quality of my life. Standing for life in Portland Oregon!! Yeah what happened to the Portland, Or. or Seattle, Wa. show? I alwyas take my son for his birthday to your tour and this year NO SHOW in PORTLAND .BOOO! My son and I are huge fans and watch every week. We would really love for you to add a show or two here so I can give my son his favorite birthday present .a ticket to the SYTYCD tour. You inspire us every week with your dancing .We love you all!!!! Hey, I don't know anyone who was hit by a car when they were sitting on a couch! Or lying in bed either!! Would be nice if my office put in a little gym for us. No such luck. I sit for about 4-8 hours a day at work, then another 3 M-Th because I also go to school. I wish I could cut my sitting hours down to 3 a day, but short of quitting my job it's impossible. Somehow doubt my employer will be setting up treadmills for all 30,000 of us at work... seeing as we just got PCs belonging to this century a couple mths ago. O is really reahicng here with the railroad as a reason for his jobs bill. The biggest scandal of the Gilded Age was the Union Pacific bankruptcy and the Credit Mobilier fraud. This scandal was the Enron of their time. PBS did a nice story on it a few years back. There is also the fact that many of the workers were chinese coolies and coolieism is a form of human slavery. You are not actually living longer, it just seems like it. July 11 2012 I had a left breast massectomy. The cancer mass, lobular was 11 cm. I found it in 2/28/12' myself. Have been o Ameridex 1 mg. It did go down 70 percent. My last breast MRI proved the mass filled 75 percent of the breast, therefor thr breast had to be removed. In the meantime..my 84 year old husband, out of the blue had open heart surgery 4 by passes. He now walks and drives. That was 4/25/12. I have always been a 4 mile a day a.m. Walker and vegetarian. I am in the hospital with I.v. And got dressed in my street clothes. Feel Great! My birthday 05/06/1933. the website I created is http://www.women70andover.com after you get there..hit the blog button on my journey. We all have it in us to pull ourselves Up! Obama should use an executive order demanding we stand when we watch TV. Thousands of TV spys could be hired to enforce this order, hiring many who are currently unemployed. They could peer into our homes, when possible, to see there is nobody sitting while watching TV. To enforce this executive order the IRS will tax those who do not comply, which under the new Supreme Court ruling makes this executive order perfectly legal. If these TV sitters are also smoking while watching TV the taxation, er, financial penalty, could be dramatically increased, and if sipping a sugary soda as well, the taxation, er, financial penalty, could be further increased. Of course, we will all then be living longer which will necessitate increasing benefits for the numbers of us who will be entering nursing homes, but we can afford this with $dollars$ we may not then have but we are pretty good at doing this. I like the suggestion that we should eat less and exercise more. This should permit us to sit more. I have also heard the suggestion we who invest in stocks should buy low and sell high. Adapting both suggestions means we can expect to live two years longer and die rich. Keep up with The outstanding posts. Stephen hawking would like to disagree with you, the guy has been sitting down since he was 8 years old and for more than half his life he couldn't even move his body and is still alive today at 70 years old, if we can move just 1 hour a day we are doing more exercise then he gets in a month, so how is he able to live for so long yet we would die early cause we sit too much ? We are a gaggle of volunteers and starting a new scheme in our community. Your site offered us with useful information to work on. You've performed a formidable job and our whole group shall be grateful to you.